I captured these images just before we left for Maine, and tonight is the perfect time to share these with you. Wheel bugs (Arilus cristatus) are amazing, and I've photographed them several times before. For more about them, including information about their painful bite, check out my post from last November. Maybe this little bug is descended from the one that just showed up on our doorstep (in a peanut butter jar!) last year. 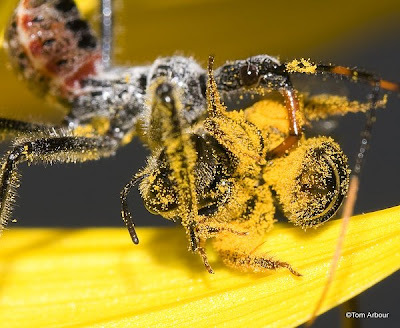 Anyways, you can imagine if their bite is extremely painful to humans, it would probably completely paralyze a small insect, like this pollen covered bee. 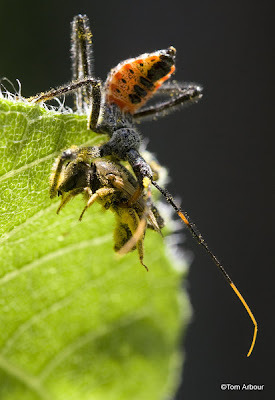 I'm sure the bee was merrily going about its gathering when this wheel bug snatched it and pierced it with that long proboscis as it hid behind the face of a sunflower. Thanks Janet- This one has been in the queue for almost a month. 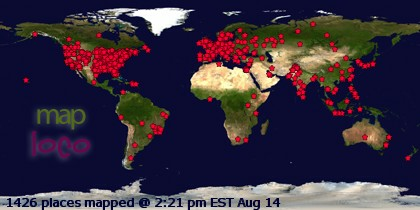 I watched it for about an hour, it really was very cool. I was hoping it would stay around my sunflowers, but I haven't seen it since July 5th. Never seen one of these before Tom, looks like something out of a horror movie, but I have to agree it is cool though. Great shots !! Cool shots, Tom. I've been seeing quite a few adult wheelies around here lately. Great shots. Our minds must be in sync. I photographed an adult yesterday evening and set it up to post this morning. This is one of my favorite bugs. People bring them to the office every year for ID. These are very beautiful images!!!! you have captured just it's awesome one! !